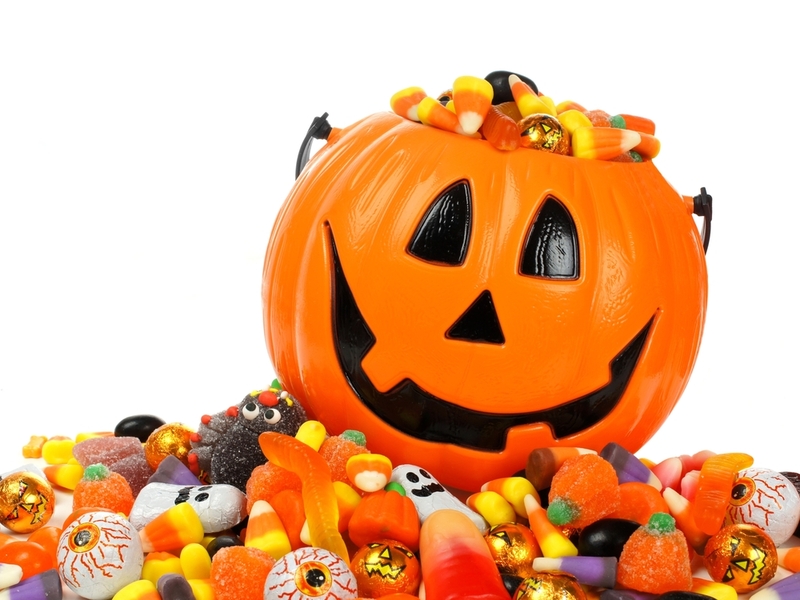 It may have been many years since you’ve gone out trick-or-treating and you may not have children, but the following Halloween candies are much better for you. I mean, you eat these at other times, too, right?. Whether you’re raiding through your children’s bags or just eating the rest left over from your bowl, Halloween candy doesn’t have to be a guilt-ridden pleasure you avoid. Here are 10 candies that won’t trip your guilt wire so hard. 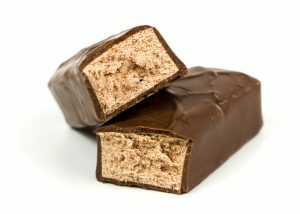 The dark chocolate gives this candy bar a great boost, because of the antioxidants it puts in your body. For the most benefits and to at least stop your sweet tooth from whining, eat two miniatures of this candy and you’ll be rewarded with 88 calories and 5.2 grams of fat. This is very reasonable and should, hopefully, stop that incessant craving for sugar. A low-fat and much healthier sweet treat, Twizzlers are even better in their snack size forms. 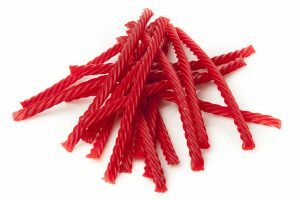 By eating just two of these tiny little sugary twisted licorice sticks, you get 100 calories and 0 grams of fat. Whether you’re into the red or black, these are your best option. So, when your child pulls out their entire bag of candy, just look for the red, or black, packets and take all of those. It’s okay, most children only want the chocolate, anyway. Just like Pringles, it’s hard to stop once you start eating Peanut M&Ms. Save yourself the regret, and grab a snack size bag. These have about 7 pieces each and offer protein, fiber, and calcium. with just 93 calories, 9.1 grams of sugar, and 4.7 grams of fat, Peanut M&Ms are a good choice for your health, though eat in moderation because the sugar content is pretty high. By now, you’ve already realized going miniature is much better. While the king size looks so much more manly, the miniature is better for your waist. When grabbing peanut butter cups, go for dark chocolate so you can get the antioxidants. To keep this candy within the healthy range, just eat a couple. Literally, two. A great thing about Reese’s Peanut Butter Cups is their wrapper. With many other candies, you can just pour them into your hand and eat as many as you want. By making Reese’s Peanut Butter Cups a bit harder to access, this can help curb a full-on binge. So, just unwrap two of these bad boys and you’ll get 88 calories, 9.2 grams of sugar, and 5.2 grams of fat. Unwrapping this colorful foil is worth it for all of the sweet-tooth satisfying goodness of a Reese’s Peanut Butter Cup. Healthy in small amounts, Tootsie Rolls also come in a wrapper. Sometimes, these can be a little difficult to open, which is good because it will give you more time to think about what you’re ingesting. By eating just three of these Tootsie minis, you’ll get 70 calories and 1.5 grams of fat. If you wanted to, that wouldn’t be hard to burn off at all. Biting into a Three Musketeers is like biting into a piece of heaven. The fluffy cream inside is very nice and just makes you want to more and more. If you’re in heaven, then why would you limit yourself? With 8 grams of sugar, your slice of Heaven didn’t quite make it high enough. When you pick up a pack of Three Musketeers Miniatures you’ll want to follow the others and eat just two. You’ll be rewarded with that amazing fluffy cream and just 50 calories each. If I were you, I would schedule these little pieces of heaven throughout my day. Assuming that Tootsie Pops are made uniformly, it most likely takes the same amount of licks to get to the center. But, of course, it’s possible that the makers decided to make them whatever way they wanted, so we’ll never know. Anyway, Tootsie Pops are a relatively healthy candy. With only 60 calories and 0 grams of fat, they more than meet the criteria, if only they weren’t filled with 10 grams of sugar per sucker. You’ll want to eat these in moderation because of this high level of sugar. But, when you do get the chance, make sure you remember to count. Due to their affordability, you don’t have to wait for your payday to get a Payday. These are pretty good for your health as they have 5 grams of fat and 90 calories. The peanuts also do wonders to help the case of this candy bar. They offer 2 grams of fiber and 7 grams of protein. That all sounds good, but 8 grams of sugar is still a lot, so you’ll want to eat these in moderation. These delicious candy bars have coconut filling stuffed into a chocolate casket. Their snack-size forms have similar specs. Calories (80 per bar), sugar (8 grams), and fat content (4.5 grams). But, the winner of these two is the Almond Joy, because its almonds will give you fiber and unsaturated fat. Your healthy diet is great, but candy bars don’t have to be crossed off of your list. Truthfully, you may not be able to cross them off even if you wanted to. They’re just that delicious. So, take out your pencil and add these 10 candy bars to your list. For most of them, the magic number is two miniatures per day. That’s more than enough to get rid of those persistent feeling of deprivation. And, next year, tell your kids to get more Twizzlers. And dark chocolate. Whether they listen is up for grabs, but you’ll want to ask the question.